Dizziness is one of the most frequent complaints in a medical office, for both primary and specialised care, and continues to be a challenge to clinical thinking. In the U.S., dizziness is responsible for over 8 million medical visits per year. Its diagnostic investigation is expensive. According to an American study, it may cost up to $2,532. to diagnose, and most of the time it is still inconclusive. Investigators are currently trying to find a controlled and multidisciplinary approach, in order to broadly and directly interfere on the causal and predisposing factors identified. Dizziness is often used as a non-specific term to describe many sensations, including vertigo, presyncope, disequilibrium and light-headedness. Dizziness is also used as a more specific term: a feeling of unsteadiness or a mild intoxication or as if the ground is rocking or the affected person has to take side steps to maintain balance. These symptoms often occur in cases where dizziness has a multisensory cause. 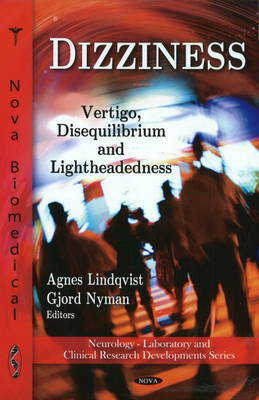 This new important book gathers information on the different causes of dizziness and the concept of vestibular rehabilitation from around the world in this field.